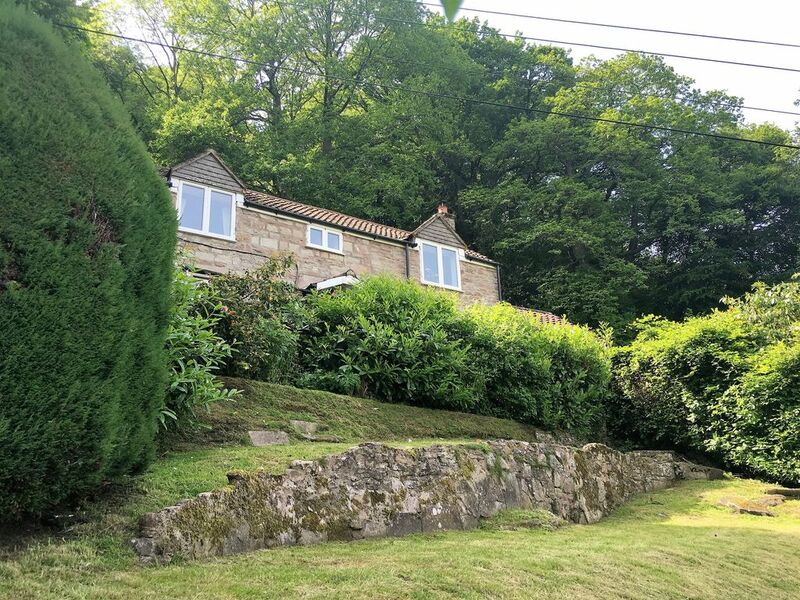 A delightful stone built detached cottage, C.1760, refurbished. Set in a truly unique hillside setting with positively stunning views over the River Wye Valley and Yat Rock, giving all the privacy that two acres of gardens and woodland affords. Absolutely ideal for walkers and nature lovers and for enjoying the many attractions of this Area of Outstanding Beauty. PLEASE NOTE: This property is approached by many STEPS AND A SLOPED PATH. Please view owners website for access statement and more information. Graham & Jan Thomson. We have lived in this area for over 18 years and we are still finding new walks to go on. Plenty to do and see in the local area. Fell in love with The Cot Cottage when we saw it and we believe it makes the most perfect holiday cottage, in a truly wonderful location. The Cottage has the most wonderful views over to the river and Symonds Yat Rock. The cottage has the advantage of being remote, but being able to look down from a distance onto the river activities. Perfect to wind down in the evening with a glass of wine, watching the wildlife (deer, pereguines, hawks etc.). The Cot is in a wonderful location, away from the crowds, offering wonderful seclusion. Please note: THIS COTTAGE HAS QUITE A FEW STAIRS & A SLOPING PATH. The views and seclusion are second to none. The cottage is set in its own grounds of approx. 2 acres, yet it is within a 20 minute walk to the river and riverside pubs. The cottage itself (circa 1760), is very homely and tastefully decorated and is extremely well equipped. You can go on wonderful varied walks straight from the cottage, either down to the river, or up to King Arthur's Cave or the Roman Fort on top of Little Doward. There are many tourist activities close by and lots to see and do. WC, sink, bath with electric shower over, heated towel rail, mirrored cabinet. There is a wood stove in both the lounge and dining room. Multi fuel burner, 3 seater sofa, chair, footstall, smart tv with built in freeview and DVD, reading lamp, 2 small display units, bookshelf (with various books and dvd's for customer use). 4 of everything, ie plates, side plates, bowls, tumblers, wine glasss, cutlery, pots & pans etc. Many thanks for your review. Sorry we didn't achieve 5 stars because of the numerous steps and steep slope getting to the cottage. We do understand that this can be a bit of a nuisance. Looking forward to welcoming you back shortly. The location is the real treat. The views from the patio table are incredible and you get a real sense of peace (a great escape from my London home). Straight from the patio is a small trail the winds you down to the river where you find the Old Ferry Inn pub which is right on the River Wye with lots of outdoor seating. Good food and surprisingly large selection of ciders. Basically you can hike all along the river valley and pop down to some river pub for some refreshment. We hardly saw anyone on the hiking trails, but when we did meet people, everyone was super friendly. We also found a mini-golf, maze and butterfly zoo across from another lovely old pub (The Old Court). There was also canoe hire. Overall if you want an escape from City life or just some lovely hikes in the countryside this is definitely worth trying! Character cottage, well presented, lovely location, friendly hosts. we came looking for a restful and relaxing time, the cottage location was ideal for this. the views were outstanding and the cottage had everything we needed for a comfortable stay. we enjoy the surrounding area having visited it many times. The Cot cottage had everything we needed and more. It is very well equipped and the extras like tea, milk, biscuits and even bottle of wine were not expected but very much appreciated. The location is great. Very quiet but short walk down to the pubs and river. Plenty of walks available within the area and a lovely garden for kids or dogs to enjoy. We are looking forward to our next visit to the Cot. Thank you Jan and Graham. Canoeing, absailing, horse riding, golf, fishing, available locally. Three pubs within walking distance, Old Ferrie Inn, Wye Knot, The Old Court. Village shop 'Woods of Whitchurch', Total garage and Spar along A40. The Maze, Butterfly Park, Mini-golf, amusement arcade within 1 mile.